© Emily Shannon Fu Foundation: Love Is Forever. Helping Others Is Life’s True Meaning. This page is designed to provide a simple example about how to utilize the favorite setting. There is a favorite setting in the latest version of Angel SoundTM (Version 5.06.01). Favorite management allows the users to save the commonly trained or tested tasks into the favorite folder. 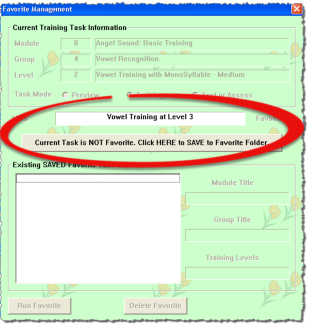 The user can directly load the task from the favorite folder instead of browsing through different modules and groups. It is quite convenient if the users perform the training or testing tasks across different modules. Meanwhile, the folder folder can also be used a reminder for the daily training session. 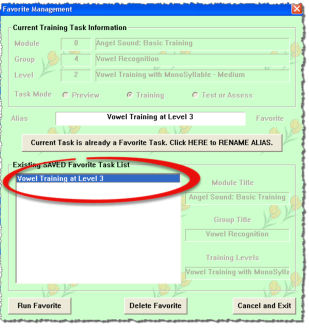 Step 1: Enter the desired training or testing task by navigating through module selection, group selection, and training level selection. Step 2: Click the “Favorite” button in the right bottom of the screen (see left figure below). The favorite management window will appear in the screen (see right figure below). Step 3: Type the alias name for the current favorite task. Then click the “Current Task is NOT Favorite. Click HERE to SAVE to Favorite Folder” button (See left figure below). After that, the alias name of the saved tasks will be listed in the favorite folder (See right figure below). Step 4: To perform the training or testing tasks in the favorite folder. Click the “Favorite” button in the right bottom of the screen at any time and select the desired favorite task in the favorite list and click “Run Favorite” button or simply double click the desired favorite task to start the task. It is very simple and straightforward.